In many nations powerful elites often control and abuse the political system based on special interests and secrecy. Given this reality, many individuals feel like “fodder” because so many dreams fail to materialize for the majority of people. Likewise, the daily grind of paying taxes to governments that abuse power based on various agendas is not only frustrating, it also destroys the spirit of many. Artists obviously belong to the same reality but for some they feel this crushing reality even more stronger because they seek to open new dimensions. Not suprisingly, for some individuals blessed with so much talent then these internal convulsions can unbalance and destroy artists because of countless “false dawns.” Vincent Van Gogh and Paul Gauguin are prime examples. They both were blessed with so much talent but the system crushed them and made life extremely uncomfortable. Therefore, in time capitalists got rich on the labor of two individuals blighted by poverty and extreme dark moments. While Vincent Van Gogh and Paul Gauguin faced their internal demons the same reality would also crush the world of Yumeji Takehisa. From radiance to despair, from hope and desire to abandonment and being disillusioned. In the end, the final years of Yumeji Takehisa were filled with sorrow and internal alienation based on expectations that his art deserved. 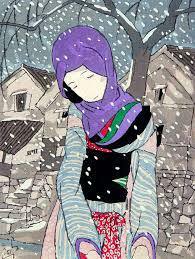 Yet the pathway of Vincent Van Gogh and Paul Gauguin – and many others – awaited Yumeji Takehisa. Paul Gauguin stated, “without art there is no salvation” but even in death “salvation” did not fully materialize for this artist. Likewise, for Yumeji Takehisa death fails to provide artistic “salvation” when it applies to international recognition. However, death provided “salvation” for Vincent Van Gogh in its entirety when it applies to international esteem. For Paul Gauguin who was extremely sophisticated, this would have been enough. Yet he remains blighted by aspects of his life that still cast a shadow. 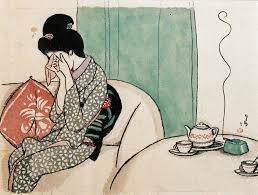 Yumeji Takehisa died at the age of 49 in 1934 and sadly the final decade was a period of sorrow. In other words, the artistic soul of hope was once more crushed by the reality of this world. For example, his visit to America and Europe in 1931 didn’t deliver the results that he had hoped for. Indeed, if anything, it confirmed to him that he was “running against the tide” because his artistic skills went unrewarded. Therefore, the international recognition that he craved for bypassed him despite being recognized by lay people in Japan. On his return to Japan in 1933, he would soon enter a sanatorium because of ill health. The following year he would die in a sanatorium at the age of 49. Therefore, one can only imagine the helplessness and frustration that he felt during the later period of his life. After all, even when Yumeji Takehisa gave everything to “open the eyes of the art world” he was still rejected. This was the same rejection that he suffered in academia despite being popular with art lovers in his native country. In other words, while Yumeji Takehisa was trying to enlighten people in the international community, it soon became clear that his reception was far from flattering. Earlier, Yumeji Takehisa had rebuilt so much of his life after the 1923 Kanto earthquake destroyed so much of his artwork. However, he bore this with great fortitude because he knew that vast numbers of people had lost so much more because many people were killed by this tragic event. Thankfully, Yumeji Takehisa was a prolific artist because he produced more than 3,000 pieces of art, therefore, he rebuilt after the 1923 earthquake. 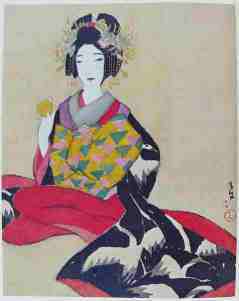 Also, the poetic nature of Yumeji Takehisa meant that he was blessed with great innovation. Therefore, despite knowing artists of esteem in Japan during his lifetime and being popular outside of academia in the land of the rising sun, it is clear that his desire failed within the academic and artistic world internationally. 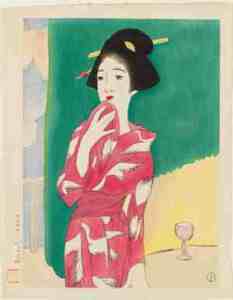 Even today you can’t find a great deal of research about Yumeji Takehisa. On top of this, his name fails to ring a bell for the vast majority of art lovers internationally. 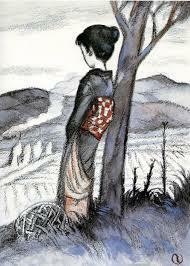 Therefore, even in death “there is no salvation” for Yumeji Takehisa despite producing many stunning pieces of art.